Ivy Brambles Ramblings: TNNA Columbus 2009 - We have arrived! Well it had to happen some time. We took the trip to TNNA in Columbus Ohio this year and with luck you will be seeing Ivy Brambles products in at least a few more store here in the US this coming season. It was quite a long drive from New Hampshire, but everything went smoothly and we set up on time. The booth looks great (the picture doesn't do it justice as I used my Cell-Phone) with our very popular silk, and Worsted Superwash taking center stage, and our new Shetland 2-ply getting immediate attention from the booths around us. The Shetland is not yet available in any stores, TNNA orders will be the first time anyone has got their hand on this new yarn and we will have two new sweater patterns available as soon as they come back from the test knitters! 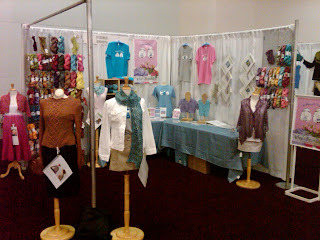 it was so nice to meet you at TNNA - am already playing with your yarn! Hope you had an awesome show and that KC is just as successful!